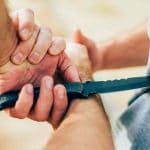 Best Fishing Knife (April 2019) – Detailed Fishing Knives Review! 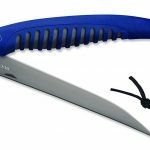 Home » Knives » Best Fishing Knife – Detailed Fishing Knives Review! Fishes are delicious. To prepare a good fish you don't only need cooking skills but you also need a best fishing knife possible. So, if you're a professional fisherman or even a regular person who is looking for the fillet knife, then you're at the right place. These fishing knives are based on my experience and also internet research so that I can give you guys the full value of your money. ​I've featured these knives according to the ascending order - price starts from 10$ and ends at 130$. So, without any further do, let's get right into the topic. Pros: A lot to offer even if it costs less than 10$. Cons: A full serrated edge blade would have been better. 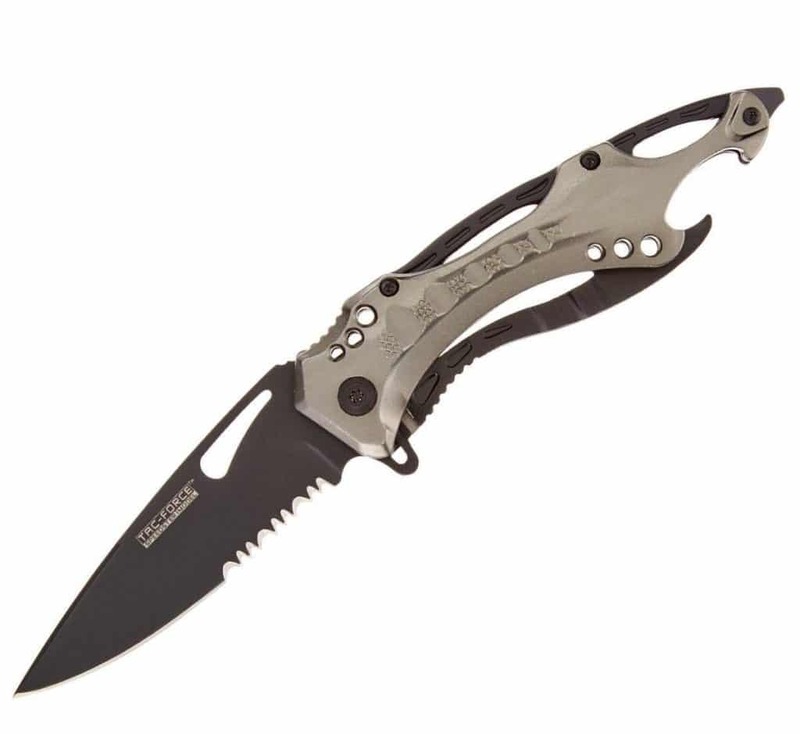 Blade & Other Dimensions: TF- 705 comes with a black semi-serrated stainless steel. The length of the blade is 4 inches and thickness is 3mm. The best part is that it's kitchen knife, overall, can't get better anymore. You can do kitchen work and on the non-veg day you can slice the meat, so it's definitely worth to be in the list of the best fishing knife. Handle & Other Stuff: It's a black aluminium assisted opening handle knife. The blade deployment of this knife is super ergonomic, so good. And, handle's end includes a bottle opener and glass breaker for emergency use. The spring assisted opening mechanism offers the quick deployment desired by EMTs, Fire/Rescue. The handle is constructed of quality metal, and it has the feel of a well put together knife. And it's pocket clip makes it as an easy to carry fishing knife. Pros: Quality Fillet knife for its price, and consist of quality material. Cons: Holds average edge retention. Blade & Other Dimensions: It's a fillet blade knife. It is 6-1 inches long and flexible. The blade is constructed of 420J2 Stainless Steel with Titanium Coating for excellent corrosion resistance. 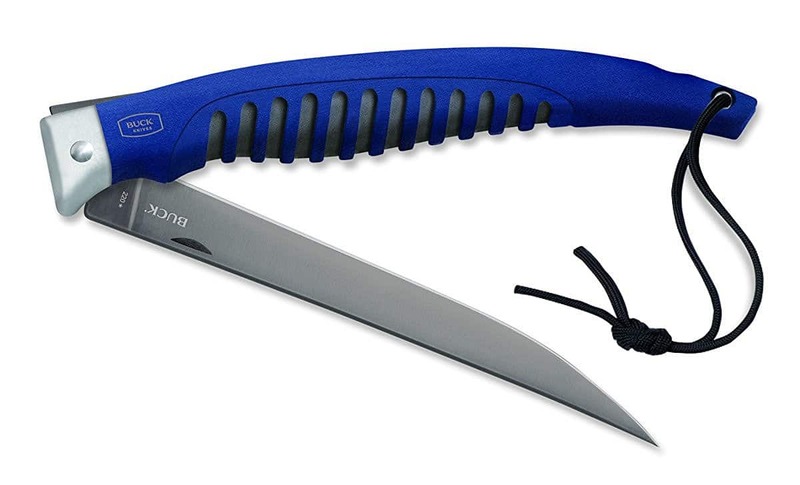 The available size, when folded, makes this knife comfortable to carry on any fishing trip. The blade is super sharp for skinning and preparing the fish. The flexibility of blade helps to pierce the skin and procedure inside of the fish with ease​. The blade is good for humidity environment and easy to sharpen. And, it holds a decent edge. There is a lanyard hole at the end of the handle and filled with a thread that helps to keep the knife with yourself. The handle makes an excellent grip even with fish oil paws; you're not going to lose your grip - hard to top that. It's a good fishing outdoor knife which you can also use for camping purposes. For its price, this knife is really worth buying, and its lifetime warranty just adds another reason to buy it. Pros: A big fishing knife with traditional design. Knife features a nice handle. 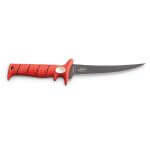 This is a 7-inch flex blade fishing knife. 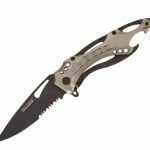 It uses patented textured no slip grip handle and stainless steel as the other Bubba Blades. The non-stick surfaced 7 Inch blade makes fish & meat cutting even easier. Blade & Other Dimensions: It's a fix 7 inches long knife. The blade is coated with non-stick material which inhibits rusting & pitting and makes meat slide off the blade effortlessly and flawlessly.. It's a plain edge blade consist of high-carbon 8CR13MOV stainless steel from china. The blade feels solid and easy to touch up. The big fixed blade fillets the fish like a boss without any problem. And, it comes with sheath which helps to carry it while hunting. Handle & Other Stuff: It's a 6 inches long handle which makes the overall length of knife 13 inches, a big fishing knife. ​The handle is very comfortable to carry and adjust when your hands are damp and slippery from handling fish. The handle is good and grippy, and becomes more grippy as you use it. If you're looking for a fixed blade big fishing knife, then look no further and buy this knife, that's all I got to say. Pros: Best two blade fishing knife. Inexpensive for its features. Cons: blade opening lock is a bit tight in the beginning. "Case knives" is a trusted company, for generations. 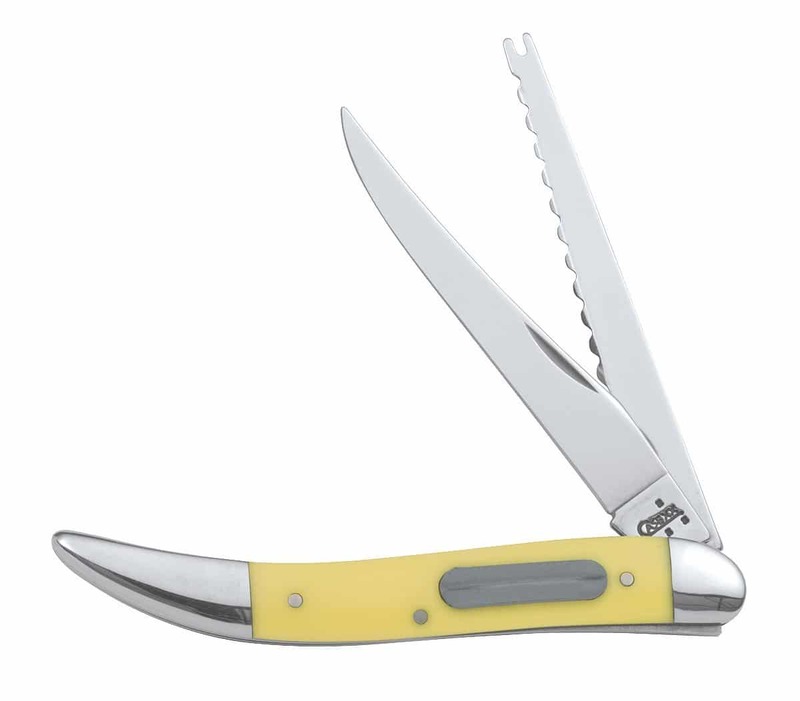 The 00120 Case Fishing Knife features a Yellow Synthetic handle, holding a small sharpening stone to keep fishhooks at their sharpest. It is manufactured in Bradford, Pennsylvania by experienced artisans using the excellent materials. 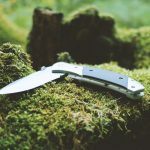 Blade & Other Dimensions: This is a unique folding fish knife that features two tru-sharp surgical blades where one blade's edge is full serrated, and another blade is full plain ​edge. 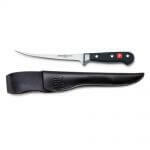 It's a top quality knife and our top pick for the best fishing knife under the budget.​ It features extremely sharp blades for all the things used for cleaning and skinning the fish to slicing up vegetables and to prepare a delicious fish dinner. Since it's a double blade knife, therefore, the serrated edge blade can be used for cutting meat whereas the plain edge blade can be used to cutting the vegetables. 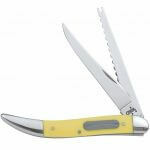 The Case Fishing Knife with beautiful Yellow Synthetic handle weighs 2.7 ounces, and it's made in the USA. The handle makes good grip, and it is pretty solid with the tight opening mechanism. Pros: Electric fish knife for a bit of automation work. Razor sharp blade for fish cutting. Cons: Problem removing the blade for cleaning purpose. Rapala is a famous knife company that manufactures tools for successful fishing. 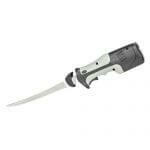 The lithium-ion cordless Rapala fillet knife is manufactured for easy preparation of fish. According to the company, the blade is capable of handling most saltwater and freshwater fish. Blade & Other Stuff: This fish knife is not heavy, if you're thinking, and its design is appropriate for making a strong hold on it.​ The knife comes with a Lithium battery and is quite strong, and the charge lasts through plenty of carving and cutting. The handle is well balanced, and equipment of handle is ergonomic and considerably tempting which pushes you just to go on and on with the filleting task that you are doing. ​The handle is specifically intended to provide you much control on your hand while moving the tool through the meat and it does a great job in this aspect. Pros: Fixed blade fishing knife. Best quality of material is used for the blade. Cons: It's not a dishwasher handle. Preparing fish needs the best cutting tool. This Japanese Gokujo knife by Shun highlights a 6-inch blade created particularly for the job of boning and filleting fish. The durable blade provides an elegantly molded shape that makes it easy to securely and efficiently cut the meat apart from the bones and joints of the flesh. Blade & Other Dimensions: The blade is 6 inches long and consists of 33 layers of VG-10 stainless-steel for a rust-free Damascus look. 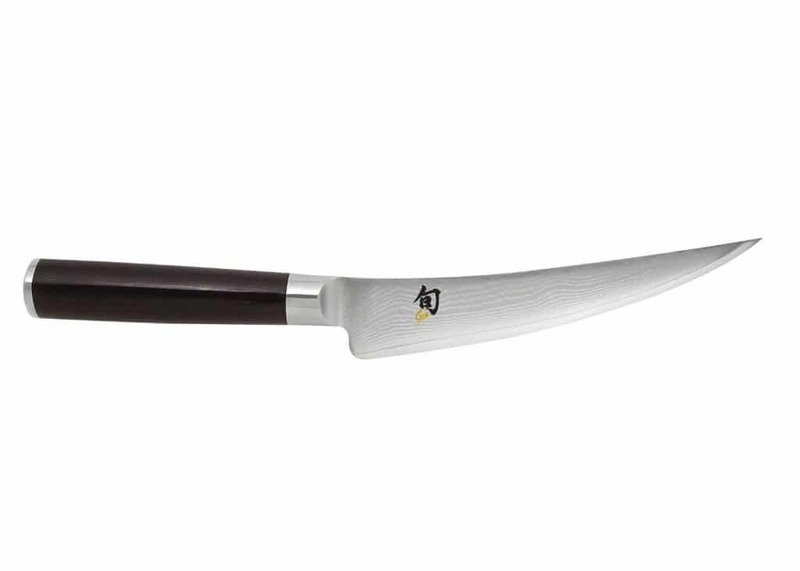 Shun Classic's perfectly sharp blade is known for both edge-holding and ease of sharpening. 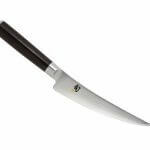 Handle & Other Dimensions: The knife features a Comfortable D-shaped Pakkawood handle and steel end-cap. The D-shaped handle fits in the palm and gives convenience and control, keeping the knife's handle guard in hand during the use. The pakkawood handle is made of resin-impregnated hardwood, and are NSF Certified for use in commercial kitchens. The preservation of the tool is relatively easy, and it serves for numerous years with no deterioration in quality. The company suggests sterilizing or cleaning it by a hand wash. Don't use dishwasher for cleaning the handle. It measures approximately 11 by 8/9 by 1-4/5 inches; and comes with limited lifetime warranty. Pros: Top notch blade and handle. Best fishing knife at affordable price. Cons: You may need to sharp the edge after the delivery. 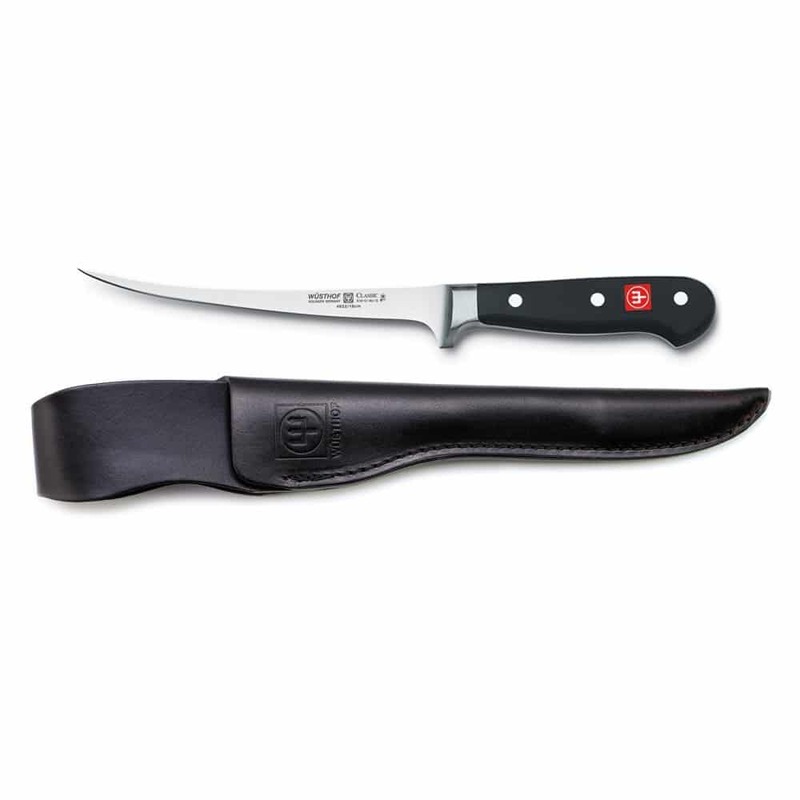 The Wusthof Classic fish knife provides excellent service for filleting, deboning and skinning tasks. It will improve the experience of serving or eating fish. It's the best fish knife under 150$. Blade & Other Dimensions: The overall length of this blade is 7 inches. The knife's blade is a construct of high-quality high-carbon steel which makes it very long-lasting and contrary to corrosion. The blade has undergone a freakish grinding and polishing process, which enables it to taper accurately. The blade is very sharp for chopping and skinning. The blade is constructed from specifically tempered high-carbon steel. The blade has incredible strength, higher than other knives that are comparable to it. 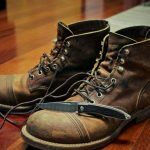 ​The blade also has a traditional handle that is triple-riveted to assure that the blade is sharp and that it lasts for a long time. Handle & Other Dimensions: The knife features a Synthetic traditional-style handle. Also, an ergonomic, triple-riveted handle allows a secure grip. The handle is constructed of synthetic substances, which helps to sport a conventional type of design.​ The Wusthof Classic 7-inch Fishing Knife is built by Germany, providing fine advantages to the customers.